Welcome back as we wrap up the first week of 30 Days With Ubuntu Linux. I guess it says something about the complexity of switching operating systems as opposed to switching office productivity suites that we are a week in and still playing around with how to just get things installed and configured. I intended to make this post about actually playing around with the Unity interface, but after all of the helpful comments from Day 6, I thought I would try out some of the tips and see what happens. First--a quick recap. I installed using Wubi installed on Windows, but did not get the Unity interface. I installed on an external USB drive, but did not get the Unity interface. I installed Ubuntu Linux locally in its own partition, and it detected my Nvidia card and installed the Unity interface...but then lost the ability to connect to my external monitor. Within the comments, though, I got advice both for adding the Nvidia drivers and using the Unity on the first two installs, and guidance for enabling the external monitor on the local install. 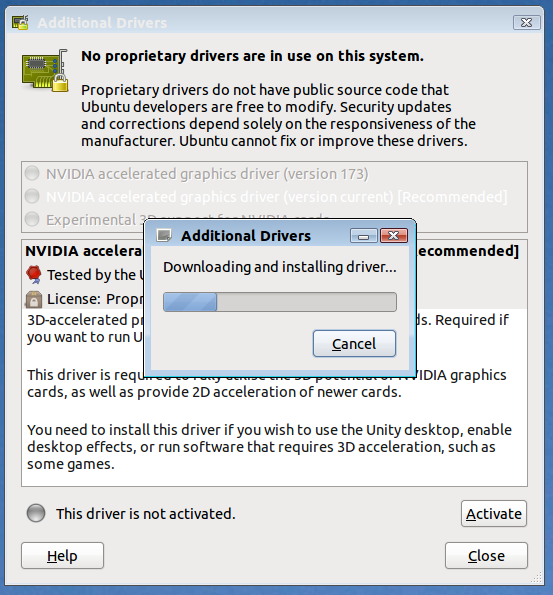 I was able to detect my Nvidia card and install the necessary driver in the Wubi install of Ubuntu. I booted in to the Wubi installation and followed the advice from the comments. I clicked System -- Administration -- Additional Drivers, and Ubuntu Linux detected my Nvidia card and identified the missing driver. I clicked Activate to download and install the driver. When it was done, I got a message stating that I would need to reboot to complete the installation process. So, I rebooted the system. I went into the Wubi install, but it just sort of flashed really quick and went back to the Ubuntu boot loader. I chose the Windows loader again, and then chose the Wubi Ubuntu install again, and it did the same thing. I did this five or six times before I gave up. Apparently my Wubi install no longer works, but I can't tell what the problem is because there is no message or information. It just goes back to the boot menu. C'est la vie! I decided to move on to testing out the other advice I got for enabling my external monitor again on the local install of Ubuntu. I chose that installation from the boot menu, then dug my laptop out from under my desk since I have to actually use the laptop display at this point. As promised, I found the Nvidia X Server Settings under System Settings in the System group. I opened it up, and clicked on X Server Display Configuration in the left column. I found that my monitor was detected, but disabled, so I clicked the monitor and selected Configure. There were three options to choose from-Disabled, Separate X Screen, and TwinView. I chose TwinView.